You have reached the leading homeowners insurance FL website. Welcome to RTC Insurance Advisors. We make purchasing insurance very easy and we represent 37 companies to keep your home insurance quotes in Florida as low as possible for your lifetime. To get a quote, please give us some very basic information in the form below so that we can render you accurate quotes. Your information will not be shared. You are also encouraged to call us for a quote over the phone if this is a better option for you. Our direct number is 352-200-2066. We also like our clients to be well informed about the type of policy you are getting, so this page will also offer you some basic information about homeowners insurance FL. 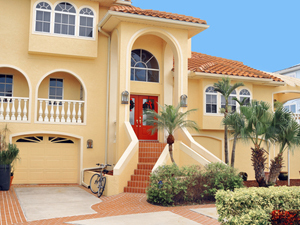 In Florida, it is not illegal to not have home insurance. No Florida law makes it compulsory. But, some gated communities and other residential establishments require homeowners insurance FL. Even lenders require applicants to have full property coverage to become eligible for loans. Having insurance is one of the practical ways where a home owner can protect his property. In the unlikely instance that an undesirable event occurs, a home owner can rely on a good insurance company for help in paying for repairs or home restoration. You could get your home insurance quotes in Florida now or read more about the basics of a policy below the form. Homeowners insurance FL will have different insurance packages depending on which company is chosen. Each package will have different kinds of coverage that will protect against particular threats such as fire, flood, hurricanes, storms, and burglary. The home owner’s house structure is usually covered by the insurance policy. Other structures within the property such as sheds located in the backyard and personal belongings within the home usually are covered only if an extra fee has been paid. We add this coverage for you. Another thing to note is that automobiles are not included in home insurance since there is a separate insurance policy for motor vehicles. There are three ways to lower your home insurance quotes in Florida. One is selecting more than two percent hurricane deductibles and increasing the All Other Perils (AOP) deductible. The higher the deductibles are, the lower the premium will be. Another option is to get all your insurance policies from one insurance company. For example, a home owner can get both home and car insurance from the same company, and insurers usually give discounts for packages of home and car insurance. The last option to lower insurance costs is availing of homeowners insurance FL discounts. Different companies have different qualifications as to who are eligible for insurance premium reduction. Different home owners have different needs. Some have bigger homes than others whilst some have more expensive furnishings and belongings. Therefore some companies are best for some types of people, but they are not for everyone. So it is important to determine which insurance company will best meet your needs. Doing company research through a reliable source such as the Florida Department of Financial Services will equip you with helpful information. Talking to us is the most helpful way in choosing which insurance company to select. There are many insurance companies that offer low home insurance quotes in Florida. Being aware of the basics, how to lower insurance premiums and picking the right company will save you from added difficulties that come with uncertainties such as natural disasters, or home break-ins or accidents. Now that you understand the basics of homeowners insurance FL, feel free to complete the form and get your home insurance quotes in Florida now. Thanks for choosing RTC Insurance Advisors. We look forward to serving you.